Happy holidays foodie friends! It's the most wonderful time of the year. Tis the season for friends, family and holiday classics. I felt like today it was most appropriate to refresh everyone's memory of the greatest Christmas movie ever, National Lampoon's Christmas Vacation! I picked out my five favorite scenes that will surely have you howling with friends during a movie night this holiday season. And as an added bonus, this movie turned 25 this year! Oh my gawwwd! The movie starts with the Griswold's getting stuck under a semi truck, and while this may cause people some anxiety, I can't help but giggle everytime I watch as Ellen's (Beverly D' Angelo) eyes look like they're going to pop out of her head. Definitely a great was to hook you in to the movie from the get go! I think as a child this scene was my absolute favorite, so I hold a bit of nostalgia. Now I see how ridiculous it is, and it makes me love it with a new sense. Also, Cousin Eddie...chills! He's a moron, and I'm DYING! Okay, confession. I love Clark, but the absolute show stealer is Aunt Bethany. At the end of the movie when Santa get's shot in the sky and she starts singing the National Anthem I lose it! She so unaffected by the everything else going on around her and just starts doing what seems most natural. Oh Cousin Eddie. What a deranged, sick individual. I half love him, half hate him, but there is nothing better than seeing him in a bathrobe dumping his waste down the drain and just so calmly (as if it's natural to be doing what he's doing) say "shitter was full." You do you, girl. Also, I don't know why but the polka "Rudolph the Red Nose Reindeer" music makes this infinitely more funny. And finally, the greatest scene, with the greatest line in this movie. Aunt Bethany was slaying the game 25 years ago, and she continues on today. This needs no explanation. Enjoy! Now of course there are so many iconic scenes in this holiday classic aka THE BEST CHRISTMAS MOVIE EVER! I didn't include any of the light up house which makes me feel guilty, but I tried to keep the list to a minimum. I'm dying to know what your favorite scenes are! 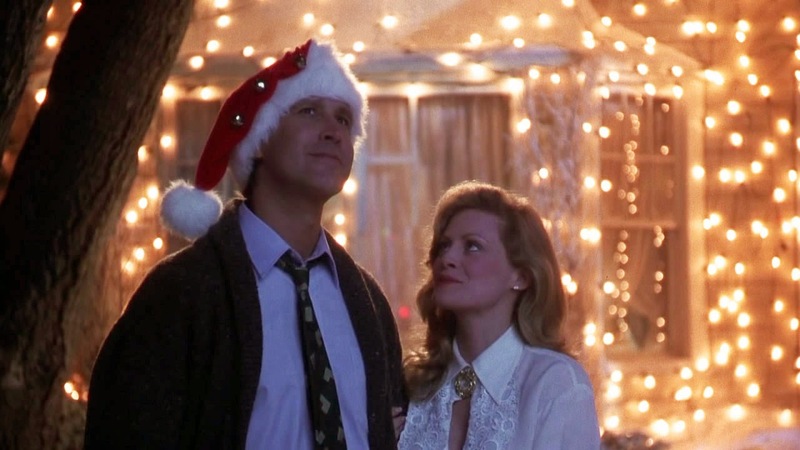 And if Christmas Vacation isn't your favorite Christmas movie then I've got to know what is!